The grave of explorer Matthew Flinders has been dug up for a new rail line. Just this week the Australian Prime Minister appeared to attribute Flinders’ greatest achievement to James Cook, inspiring jokes that Flinders’ ghost is trying to secure his place in history. Flinders is most famous today for leading the first circumnavigation of Australia. On a previous voyage he and George Bass sailed around Tasmania, proving it was not connected to the Australian mainland and cutting several days off the journey from Europe to Sydney. His book, A Voyage to Terra Australis, brought many of the wonders of Australia to Europeans’ attention, and is considered an outstanding example of scientific description. Flinders observed the unusual tides in the Spencer and St Vincent’s Gulfs, where twice a month the water height remains stable for up to three days. He also explained the phenomenal tide heights at Broad Sound, Queensland, work used to explain anomalously large tides elsewhere. European explorers were frequently contemptuous of Aborigines, but Flinders formed a friendship with Bungaree, who accompanied him on his major voyages. Flinders’ voyages coincided with a similar, but much better funded, French expedition led by Nicolas Baudin, which also investigated Australia’s coastline, flora, and fauna. The two ships met in what became known as Encounter Bay, South Australia in 1802. Both captains believed their countries were at war (unaware of a brief peace treaty signed two weeks earlier), but prioritized science over nationalism and shared information on their respective discoveries. 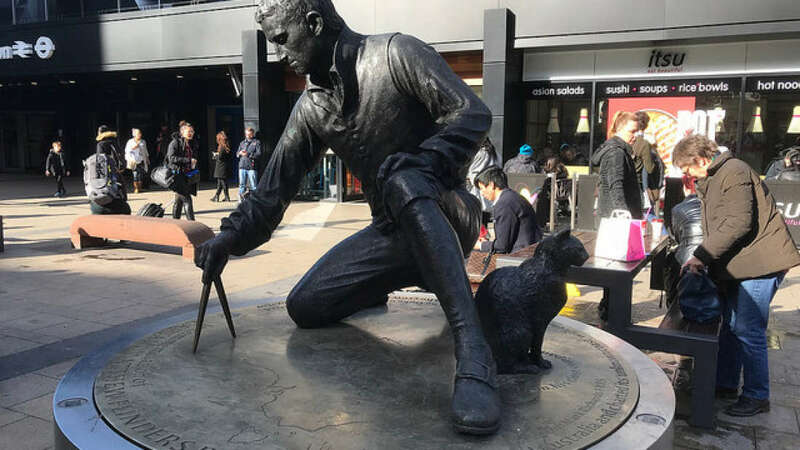 Unfortunately for Flinders, when he was forced to land at Mauritius on his way home the French authorities took a different view, imprisoning him for seven years and allegedly letting slaves eat his beloved cat, Trim. Flinders never fully recovered and died in 1814. The headstone for his grave was moved when the expansion of Euston station impinged on the St James’s Gardens cemetery in the 1840s. With more than 60,000 people buried at the site, prospects for identifying Flinders’ grave were considered slim. Last week Australian Prime Minister Scott Morrison announced a $6.7 million grant to circumnavigate Australia in a tall ship, strangely to be done in a replica of Captain Cook’s Endeavor, rather than Flinders’ Investigator. Many people wondered if Morrison had confused the two, and hope the find will see Flinders get the recognition he deserves.